Easy to use press button controls, sturdy metal belt clip, low battery indicator, treatment timer countdown, dual power, battery charger (same as a mobile phone charging systems) can be recharged from any AC power source and any USB connection (computer / printer) 5 Year Warranty. New Fully Digital Tens and EMS Combo unit with AC power. Large LCD screen and user friendly push buttons with pause function makes repositioning electrodes a snap. Power saving feature turns unit off in 5 minutes if not being used. Fully digital for effective and reliable treatment. 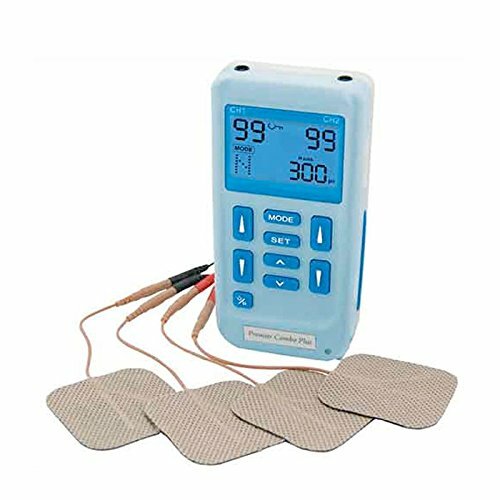 1 x Pack of self-adhesive electrodes 2"x2"
24 clinically approved programmes 12 TENS Programmes and 12 Muscle Stimulation Programmes. If you have any questions about this product by Med-Fit, contact us by completing and submitting the form below. If you are looking for a specif part number, please include it with your message.